It is always darkest before the dawn, and it is always leanest before spring. These are the hungry months, when the cold and dark aren’t brightened by holiday lights and high spirits. It’s a tough time of year for body and soul. And oh, this endless, relentless winter! The winter of 2014 has frozen our smiles and smothered our spirits with deep snowdrifts, ice, and storm after storm. Even in Maine, people are shaking their heads in disbelief. After yet another long dog walk, struggling over ice-crusted, snow-covered fields, I came in once again blind from the glare, and feeling as barren and icy inside as the world was outside. I was so hungry. It was time to eat. I appreciate how the whiteness of the world outside is offset by the deep vibrant colors of winter vegetables. Their deep oranges, reds, and greens announce their nutritional value. These are not the foods of warm sunny days, loaded with water and crunch. These are the foods that pack a wallop, that help a body burn energy brightly enough to carry it through a day of high physical stress. What would you choose to eat before shoveling a snow-swallowed driveway? A salad with a fresh peach? Maybe, if you were in a very optimistic mood – unlikely after 4 months of winter. A much better start would be a lunch of hot carrot soup topped with toasted almonds. And a slab (no limp, puny slice today!) of good bread, heavy with grains. I trust Mother Nature, so I believe that eating what is available locally will give your body the vitamins and nutrients it needs on that day, at that moment. Mother Nature offers me beets, not peaches, on a March afternoon in Maine. I’m going to listen to her. Actually, I’m going to listen to Barbara Damrosch. 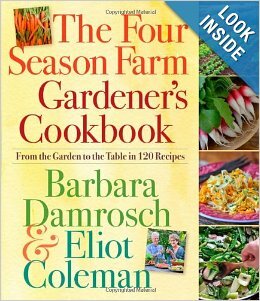 Her latest book, “The Four Season Farm Gardener’s Cookbook”, has a recipe that includes baked beets. Here, reprinted with her permission, is a part of that recipe: instructions for baking two medium-sized beets. — Position a rack in the center of the oven and preheat the oven to 350°F. — Trim the beets so that just a bit of stem remains. You can leave the tails (the thin roots) on. Scrub the beets and let them dry. Do not peel them. – Wrap the beets individually in aluminum foil and place them in a small casserole or ovenproof pot. Cover, and bake for 3 hours (4 hours if you are using large beets, 2 for small ones). — Remove the beets from the casserole and unwrap the foil. Set them aside to cool for about 5 minutes. Then trim off the stems and tails, and peel off the skin. The result: delicious baked beets to eat warm with butter, salt, and pepper, or perhaps coarsely chopped over a bowl of cooked grains. Beets are in season now, they are what your body needs, and they are delicious. Baking them preserves every single vitamin you will need to shovel that driveway! Nuts are another source of energy for these tenacious, frozen days. I love this recipe for Sweet and Spicy Almonds from chef Carroll Peregrinelli. They are the perfect appetizer to serve guests, the perfect accompaniment to a bowl of hot soup for lunch, the perfect snack to slip inside your mitten for those long walks with the dogs in the snowy woods. Preheat oven to 275 degrees F. Line a sided baking pan with parchment paper. Set aside. In a large resealable plastic food storage bag, add first set of ingredients. Seal bag and shake. Set aside. Mix egg white and water in medium bowl. Add almonds. Stir. Drain almonds. Add drained almonds to resealable bag. Seal bag and shake. Spread almonds in single layer on prepared baking pan. Bake for 30 minutes. Remove pan from oven. Reduce heat to 200 degrees. Stir almonds in pan and return to oven. Bake for an additional 30 minutes. Leave in pan to cool on wire rack. Store in an airtight container for up to 2 weeks. May also be frozen. Check out her website, http://baking.about.com/, for other wonderful recipes and tips. Try the carrot soup recipe from “The Moosewood Cookbook” by Mollie Katzen. She offers, as always, variations to try. My favorite is to thin the soup with buttermilk, season it with thyme, marjoram, and basil, and top it with toasted almonds. Served steaming hot, this soup will comfort you and sustain you on a dark winter’s day. Its bright orange looks like a bowlful of sun. 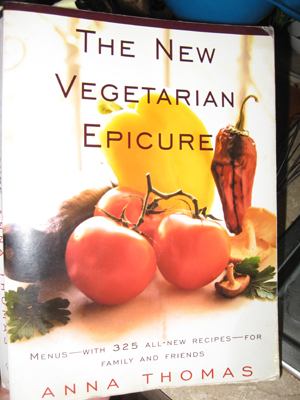 “The New Vegetarian Epicure,” by Anna Thomas, touts the advantages of roasting vegetables. Roasting vegetables is easy, requiring you to turn them only once or twice while they cook. Remember, you don’t need the watery, crunchy brightness of summer vegetables now. You need vegetables cooked down to their essence, with their texture slightly chewy, and the sugars caramelized within. Think about it: Are YOU watery, crunchy, and bright this March?! I’m guessing not – and I’m also guessing that those that love you would describe you as deeply sweet, perhaps even slightly chewy (in a good way, of course). Tossed with a bit of olive oil, a little salt, and then roasted, vegetables like parsnips, potatoes, and even green beans become the star of any meal. Would I begin my day with a boiled egg and some roasted vegetables? If that day were starting off at minus 19 degrees, the answer would be a robust Yes! “The Silver Palate Cookbook,” by Julee Rosso and Sheila Lukins has a knockout recipe for a beet and apple puree that, depending on the emotional stability of your guests, will cause either a sensation or complete panic. The beets are roasted, and the peeled apples are sautéed with onions. Puree the whole mess, and the result is a thick, fuchsia-colored puree that is delicious hot (or cold, but save that presentation for August). Paired with a roast at your winter table, it is the most unusual of side dishes, nutritious, and beautiful. Eat well! Take every winter’s day as an opportunity to cook and eat something that makes you say “YUM.” Season everything with savory herbs. Serve everything very hot. If you’re busy looking forward to three deeply satisfying meals every day, spring will come before you know it. Time to wake up those napping dogs, and take a walk outside in the snow – you will beat back the Hungry Months, and leave the winter of 2014 where it belongs: in the distant past.